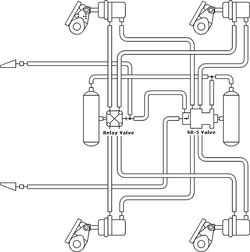 Early concept for insuring safety: create a protected spring brake reservoir. Note that reservoirs are designated "service" and "spring brake". More advanced concept insures safety using the valve to "protect" a level of air pressure to manage emergencies. Reservoirs are not specified as "service" and "spring brake". 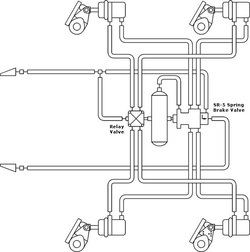 The current technology in trailer spring (emergency) brake control is a valve that can safely manage the supply of air for service and parking brakes using just a single large reservoir. Bendix SR-5 valve uses air pressure from the trailer supply line rather than from any reservoir in this two reservoir example. If the reservoir is sufficiently large, no more than one reservoir is required with the Bendix SR-5 to achieve safe trailer spring brake control.